I’m sure all of us have seen at least one film by Tim Burton. A young boy who grew up in the strange suburban world of Burbank, CA, young Tim’s sensibilities were entranced by monster movies, which soon made their way into his sketches of saucer-eyed, spindly creations. Parlaying his love of art into a career, Tim was accepted into the California Institute of the Arts, and worked briefly for the Walt Disney Studios. While dabbling in hand-drawn animation, he soon created the stop-motion shot Vincent, and a live-action short based on a story called Frankenweenie, about a young boy who reanimates his dead dog back to life. But soon, Tim wanted to branch out and explore new frontiers, and left ‘The Mouse House’ behind. He then went on to Warner Brothers, where along with Phil Hartman and Paul Reubens, crafted the film Pee-Wee’s Big Adventure, about a man-child who goes on a bizarre road trip to recover his beloved bike (and given the way that bike looks, wouldn’t you?). After Pee-Wee, Burton got ahold of the script for Beetlejuice, which became a surprise hit as well. Concerning the Maitlands (Alec Baldwin and Geena Davis), an incident on the town bridge causes them to die, trapping them in their house as ghosts, unable to leave. If they do, they find themselves on a strange desert landscape, inhabited by giant striped sandworms. Of course, all is not well, as their home has been sold to a family of New York subrubanites. Though their afterlife caseworker named Juno says they should scare the living inhabitants out themselves, the Maitlands get conned into unleashing Beetlejuice, a pasty-faced, freelance bio-exorcist. With numerous films of Tim Burton’s released on DVD, it’s rather odd that given the films from the first 10 years of his directing career, Beetlejuice has been sidelined for so long regarding extras, and other making-of goodies. 1) Audio Commentary – Burton is one of the few directors who has given in and done commentary tracks for the majority of his feature film releases. However, even when he does commentaries, it works best if he has another person in the room to speak with. Lone commentaries (like the one he did for Edward Scissorhands), can be a little ‘bland.’ The one he did for Pee-Wee’s Big Adventure had him trading words with Paul Reubens, and one could imagine him doing a Beetlejuice commentary with Michael Keaton. 2) Interview/retrospective with the cast and crew – 25 years later, almost all the main cast of the film are known for other works, and a few of them even went on to work in other Burton-related productions (such as Michael Keaton, Catherine O’Hara, and Winona Ryder). – a scene of the Maitlands clinging to a windowpane while on the Sandworm planet. This was most likely an exterior view of when the two were clinging outside the upstairs window when the Deetzes discover the miniature model of the town in the attic. – After he and Barbara return to the house after dying, Adam’s plan to ‘retrace their steps’ was supposed to send him to a world of large gears tearing up the landscape. Early test audiences didn’t ‘get’ this sequence, and scenes of Adam and Barbara encountering Sandworms was used. – The scene where the Deetzes are menaced by Beetlejuice as a snake was also different from the final product, which featured a spiky-toothed Beetlejuice head on a snake body. Originally, the snake had no trace of Beetlejuice in its appearance, but the decision was made to not use the footage that had been shot. It’s possible that the design was changed, because some people may have been confused that the snake was actually Beetlejuice in disguise. – After test audiences responded favorably to the afterlife waiting room sequences, one of the final sequences would have had the elderly barber named Harry (whom Adam encountered early in the film when he and Barbara went to town), be in the waiting room. In the end, the scene we know had a witch doctor sitting in Harry’s place. 4) Visual Effects Retrospective – There are plenty of memorable effects in this film, from stop-motion puppets, to makeup effects. It would be nice to see if any effects tests or film exists regarding these items, and maybe some of the artisans talking about being allowed to dabble within Burton’s imagination. 5) Isolated Score – Several Tim Burton/Danny Elfman collaborations on DVD have included an isolated score of Danny Elfman’s score. It would be nice to include this little extra, wherein we can hear Elfman’s orchestrations minus dialogue and other sound. I will admit that when I first saw previews for Beetlejuice when I was 8, it looked really neat and exciting. However, it was one of several films I saw in 1988 where my eagerness turned to uneasiness. This was my first introduction to the works of Tim Burton, let alone alot of the tropes regarding dead people, skeletons, and strange transformations. Needless to say, I had the same reaction to Beetlejuice as I did with Poltergeist. Of course, the next year when Batman was released, I got through that one pretty well, though it wouldn’t be until high school that I’d grow to like and understand Tim Burton’s films more, thanks to our Band Director creating several marching shows consisting of Danny Elfman’s music (one of which had us marching to the Beetlejuice theme!). I’m sure I’m not the only one who would love a new release of this film with the items I’ve mentioned above. As it stands, Beetlejuice isn’t the last Burton film to get extras. There’s also Tim’s 1997 film Mars Attacks, which has plenty of room for special features material. There’s more then enough material in that film that would make for an interesting discussion, including Burton’s decision to use computer animation for the martians, instead of the original plan for stop-motion. The top image shows several effects men working with a cable-oprated puppet of the original snake. The lower image is a black-and-white image from the original sequence, showing Delia Deetz (Catherine O’Hara) in the clutches of the menacing creature. Though famed directors Hayao Miyazaki and Isao Takahata founded Studio Ghibli with their visions during the late 20th century, the first 10 years of the 21st century opened the door for younger directors to make their mark with the studio. There was 2002’s The Cat Returns, a pseudo-sequel to 1995’s Whisper of the Heart. 2010 saw the release of the Miyazaki co-scripted, The Secret World of Arrietty, based on Mary Norton’s book, The Borrowers. However, there was one film released between these two, that would be spoken of in hushed tones by several Ghibli fans. In 2006, the studio released Tales from Earthsea, based on the popular books by Ursula K Le Guin. When it came time to develop the film, it was decided by producer Toshio Suzuki, that the reins would be handed to another Miyazaki: Hayao’s son, Goro. This led to some negativity between father and son, with the elder Miyazaki feeling his son did not have the necessary experience for such a task. Words were not exchanged between either during the film’s production. Upon release, its reception was a mixed bag, with some entranced, and others who found it lacking in regards to its source material. I will admit that out of all the films produced by the studio, I still am not interested in seeing Earthsea. In some respects, it is to Studio Ghibli, what Cars is to (some) PIXAR Animation Studios’ fans. Five years after Earthsea, the studio released From Up On Poppy Hill. Unlike the wedge between father and son from the Earthsea production, Hayao co-wrote the film’s script with Keiko Niwa (both also worked on Arrietty), and Goro returned to direct. Unlike the fantasy world that Goro stepped into with Earthsea, Poppy Hill places its audience in our world, albeit Japan in 1963. The main protagonist of our film is Umi Matsuzaki, a young high school girl who has also taken on the responsibility of helping take care of her family’s boarding house on a hillside in Yokohama, and looking after her siblings and Grandmother. Along with preparing morning and evening meals for the house’s tenants, Umi also has a morning ritual of her own: raising a set of ‘signal flags’ on a flagpole overlooking the town’s harbor below. One day, one of Umi’s friends notices that someone at the school has written a poem in the school’s newspaper, about a young woman who raises signal flags on a hill. They briefly wonder who wrote the poem, when their attention is caught by the young men of a dilapedated building on school grounds called The Latin Quarter. One person whom Umi meets here is Shun Kazama, a young man who runs the school’s newspaper out of a room in the building. In exchange for ‘help’ on an upcoming exam, Umi helps Shun prepare the next edition of the paper. While she assists him, she begins to grow curious regarding the strange building. Though dirty and largely populated by young men, it house the majority of the school’s many clubs, and those inside its walls are trying desperately to save it from demolition. Poppy Hill is a film that falls into that category of Ghibli films that may turn away most who are more attuned to the magical films made by the studio. However, for those who love Ghibli‘s work regarding films like Whisper of the Heart or Only Yesterday, this will definitely seem like putting on a pair of comfortable shoes. Of importance to the film’s theme, is not forgetting your past, as you move forward. The film is sandwiched between the aftermath of World War II, and the 1964 Olympic Games, which were held in Tokyo. In our modern world, images of Japan largely are of neon-lit, Metropolitan cities. This film shows us a time before that, with Yokohama’s buildings seeming simple, and not so grandiose. One scene even had me wondering how long many of those wooden structures lasted, before they were torn down in the name of progress. The Latin Quarter becomes an unofficial symbol of an object caught in the crosshairs of the old and new. In a sense, the place almost feels like a combination of Animal House’s’ Frat house, and the bathhouse from Spirited Away. It’s an impressive structure, but definitely feels like the kind of place that multiple young men would inhabit, given its unclean interior. For this review, I’ve refrained from showing any key screenshots of the structure, as it would detract from experiencing it with your own eyes when it’s revealed on screen. Character-wise, there are plenty of things that one can expect when they see Umi and Shun, and some things one might not expect. There are quite a number of supporting characters, not to mention numerous members of The Latin Quarter, several of which seem to have been inserted purely for comic relief. The film is not bad for Goro Miyazaki’s sophomore effort, though online there seem to be a few debates here and there over which Miyazaki is to be credited for the film: Goro for his directing, or Hayao for his co-scripting. I do wonder if Goro is a lover of fading out on a scene. I think there are more fade-outs in Poppy Hill than any other production from the studio’s catalogue. Poppy Hill also marks the first distribution of a Ghibli film in the USA, that isn’t under Walt Disney Pictures (though Disney is handling international distribution in some markets). Distribution of the film and future Ghibli releases, are being handled through GKids. GKids has been instrumental in recent years, for releasing several foreign animated releases into theaters, including Oscar nominees The Secret of Kells, and A Cat in Paris. In the end, From Up On Poppy Hill is a wonderful time capsule of a film, capturing youths in Japan at a cross roads in time. Call it blasphemous, but to me, it is not too dissimilar to George Lucas’ American Graffiti, an American film set in 1962, showing American teenagers also at a moment in time betwixt past and future. *Special Thanks to Eric Prahl, who helped make this review possible. It’s hard to believe it’s been almost 5 years since Shout Factory took over distribution of putting Mystery Science Theater 3000 episodes on DVD. Starting with Volume XIII in the fall of 2008, we are now almost 5 years and 13 volumes into their continued efforts to keep circulating the tapes on DVD. Volume XXVI continues the presentation of 4 more ‘cheesy movies’ to DVD with themed packaging, specially-created DVD menus, fancy DVD cases, and 4 DVD-sized prints of the case art done by Steve Vance. So, now that we begin our countdown to “Vol L,” let’s see what the latest release has to offer. Throughout the years on the Satellite of Love, several filmmakers would return again and again as ‘repeat offenders’ with their film repertoire. One of those directors was Mr Bert I Gordon. Throughout much of his career, Bert was known for films with really big things, such as The Amazing Colossal Man, and Village of the Giants. However, with The Magic Sword, Bert instead chose to focus on a more fairy tale-like storyline. A mortal young man named George (Gary Lockwood) lives with his elder stepmom/sorceress, Sybil (Estelle Winwood). Though George is not yet 21, Estelle still has no qualms about treating him like a child. Even so, this doesn’t stop George from observing the kingdom’s Princess Helene (Anne Helm) in a magic pool. But as George watches, the Princess is kidnapped by the sorcerer Lodac (Basil Rathbone), with the promise that he intends to feed her to his dragon in seven days, as revenge on the Princess’ father for executing his sister. It just so happens that Sybil has numerous enchanted objects that can help George, but she tells him he isn’t to have them until he turns 21. But as one can expect, George tricks Sybil, and gets his accoutrements. Joining up with the King’s most heroic knight Sir Branton (Liam Sullivan), the quest begins, with the group having to make their way through Lodac’s seven curses. Most of Gordon’s works have taken place in modern times, and this was his first attempt at a ‘sword and sorcery’ film. It’s not quite Sinbad, but it has a great flair for being a nice Saturday afternoon adventure, even causing Joel Robinson to quote the line at the beginning of this little mini-review. One fun little bit is Crow falling in love with Estelle Winwood in the film, to the point that he is even willing to throw away his obsession over Kim Cattrall from a previous film viewing. Along with The Magic Sword, the disc also includes a brief 8-minute feature entitled Bert I Gordon: The Amazing Colossal Filmmaker. I must admit I was hoping for a more lengthy piece regarding Mr Gordon. This little feature mainly covers Bert’s musings about his early love of films, and his early work in the midwest before deciding to strike out for Hollywood. As for Bert’s films, they are largely confined to just a small smattering of images and summary about his making of films dealing with size-related people/creatures. Over the years, we’ve been told in school that ‘it’s what’s inside that counts,’ but when it comes to making films, it’s usually what’s outside that sells tickets. We’ve seen all manner of beautiful people that serve on magazine covers (known as ‘models’), be snatched up and thrown in a film on their looks alone. This most definitely was the case when Kathy Ireland was cast in the Golan-Globus picture, Alien from LA. Though if thoughts of Kathy Ireland being a beautiful alien girl crash-landing in the land of sun-and-surf are on your mind from this title…IT’S A TRAP!! Even though the film’s original poster showed Kathy in tight jeans and a belly-baring t-shirt, the majority of the film has her playing a squeaky-voiced, glasses-wearing shrinking violet who is even rebuked by her ex-boyfriend for being so afraid. Soon after she’s dumped, Kathy’s character receives a letter that her archaeologist father has disappeared, and she goes off to try and find him, only to find herself in a strange world deep beneath the surface of the Earth. One can only wonder what words were used to convince Kathy that this film was a good career move. It plays almost like a (very) loose interpretation of Jules Verne’s Journey to the Center of the Earth. This is evident in the name of Kathy’s character, Wanda Saknassum. Her last name is similar to another character in Verne’s story, though one can’t also help but see a tinge of Alice in Wonderland in the film, given that Wanda falls down a hole into a strange world, and just wants to go home. For the life of me, I can’t tell you what is going on the majority of the time with this film. Much of it is just Kathy’s character running into one situation after another in a strange, Mad Max-like society that includes everything from a woman with a tail, to a little person (Deep Roy) with 3-inch eyelashes. Several DVD releases in the past have had interviews with cast and crew of a film, and this disc actually goes straight to the source for its interview: Alien From LA’s writer/director, Albert Pyun. Over the course of 8 1/2 minutes, Pyun tells of his making the film, casting Kathy Ireland, as well as his reaction finding out that his film had been chosen to be riffed on by the MST3K crew. They say ‘success breeds imitation,’ and that was certainly the case as the 60’s wore on. After the successful run of James Bond films in the early 1960’s, the “Eurospy” genre of films was born, with all sorts of European productions attempting to cash in. Some even went so far as to sneak in the numbers ‘007’ in their (non-James Bond) film titles, before United Artists put an end to it. The guys on MST3K encountered several of these terrible films (including Secret Agent Super Dragon, and Operation Double 007, which starred Sean Connery’s younger brother!). With this DVD set, we have the more-exciting-than-it-sounds Danger!! Death Ray. After a scientist and his Death Ray (made purely for “peaceful purposes”) are kidnapped, an unnamed government organization puts its top agent named Bart Fargo (no, really, that’s his name!) on the case. 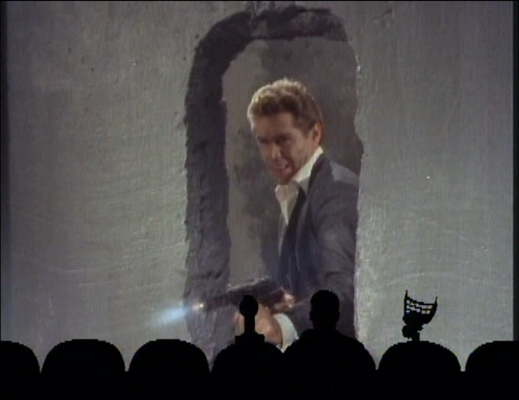 Bart faces all manner of enemies at every turn, including one whom the MST3K group jokingly refer to as Abe Lincoln given his beard (“Abe Lincoln, IS, Time Cop!”). He also meets a young female artist, who becomes the obligatory love interest, and seemingly falls for Bart because she has little else to do. Some films that are just plain stupid I can easily dismiss as fun (like the horrid Wild World of Batwoman), but Death Ray often gets me seething. Why? Well, I guess it has to do with that Death Ray. A scientist creates a death ray that he claims was made for “purely peaceful purposes,” so…WHY CALL IT A DEATH RAY THEN!? For that matter, very little about this weapon of mass destruction is hit on, except for a few moments at the beginning and the end of the film (“By now the death ray has been completely forgotten,” quips Crow at one point). As well, Bart Fargo is so sickeningly suave and charming, that I was soon wishing for someone to take him down. There are also some lines that are just plain wrong. When Bart is called into his Superior’s office, where he attempts to interject that he’s on vacation, his boss just speeds through his lines, calling Bart “worse than an Arab.” It doesn’t help that the boss is another one of those ‘I hate your guts but you get the job done’ kind of bosses, and there’s even a secretary that just screams ‘Moneypenny’ given Bart’s ‘obligatory flirting scene’ with her. There are plenty of great riffs in this, and a few scenes cause the crew to start chuckling humorously at the film’s budget cuts when it comes to doing some major ‘effects’ work. As well, they can’t stop chuckling regarding the name of our secret agent. The film even causes Tom Servo to build his own ‘peace-loving’ death ray, and ends up using it on Crow during one of the interstitials. This disc is the only one in the set that includes a small featurette that isn’t directly related to the film. In this case, we have Life After MST3K: Mike Nelson. Mike gives us a little overview of his time on MST3K (can you believe he was 25 when he started with them? ), and what he did afterwards, from authoring several books, to helping co-found Rifftrax to riff on major film productions. During the many seasons of MSt3K, there were several references to the Universal Pictures release, The Mole People. There were several instances where actors appeared in skits dressed in mole people masks, and in the film Wild World of Batwoman, the filmmakers of that production re-used footage from the film! Strange then, that it took until Season 8 for the showrunners to even tackle this film. As for myself, I had never seen The Mole People until I opened up this boxset. Several men are working at am archaeological site in Asia (nowhere in particular in Asia, just “Asia”), when an Earthquake in the region reveals strange artifacts and ruins that seem to suggest a hidden race of people. After getting trapped below the earth, the men come across an albino-skinned race of people, whose eyes have adapted to the low light of the inner-world, and who have enslaved a race of strange creatures that can burrow under the ground. The archaeologists find that their flashlights make the ‘mole people’ see them as gods. However, the high priest of the people (Alan Napier) soon suspects that these men are not what they appear to be. This was one of those films that took me awhile to get into, mainly because of the ‘humans wander into a strange world and are hailed as gods’ thing I’ve seen done many times over (anyone see Dreamworks‘ animated film The Road to El Dorado?). There’s nothing very likable or intriguing about our archaeological ‘heroes,’ other than one of them is played by Hugh Beaumont, a year before he’d become the television patriarch of the Cleaver family. For this DVD release, a 17-minute documentary is included titled Of Mushrooms and Madmen: Making The Mole People. I actually found this little extra to be quite intriguing, in that it tells how the film became one of several that was made using Universal Pictures‘ plans to make films largely with stock footage to cut costs. There’s even several minutes dedicated to talking about some scenes and situations that flew in the face of 50’s censors. After you see this, you may not look at the film the same way again. Finally, I thought I’d add a few words regarding Shout Factory’s presentation of this set. They continue to provide the same boxset design as their last 12 releases, and it’s nice to see this theme continued. Over the course of their releases, the company has continued to make little strides in regards to the DVD menus for these releases. They did some great work on Vol XXI’s set featuring 5 Gamera films, and I must admit I am very impressed with what they have done with this set. The DVD menus for almost all these films have some great detail that seems to rival even some of Hollywood’s DVD menu work. Each of the films even comes with a theatrical trailer, so you can see how the films were advertised when they were released in theaters. For example: Danger! !Death Ray’s trailer is over 2 1/2 minutes of almost every single action sequence in the film. It also contains the film’s only two songs, and gets so monotonous, that I started singing “watermelon man” like Tom Servo did during the film’s main riffing (proving how much they dulled the pain of that film with their work). I will admit that when it comes to most MST3K DVD releases, most of them are kind of hit-and-miss for me. I’ve only bought a few sets that ever had all four DVD’s be entertaining, and not all of the releases from Shout are on my shelves. Volume XXVI is definitely one of the more entertaining sets to be released, and gets high marks from me regarding the film choices, and the presentation of the set. Well, this is definitely a first for my reviews on this blog. It’s not often that I decide to pit two different products against each other, but in this case, it seemed inevitable. Back in November of 2012, I reviewed The Disney Store’s Vanellope Von Schweetz Racer (which also became my most-viewed blog post for 2012! ), and had a few things to say regarding its design and quality. At the same time, Thinkway Toys released their own version of Vanellope and her kandy kart. However, finding one of these was next-to-impossible, until I happened upon one at Toys R Us in mid-December. With both versions of this toy secured, I’ve decided to have a showdown regarding size, quality, price, and movie-accuracy. And so, let my first toy showdown…commence! I know I should start with the driver of the kandy kart, but for me, the design and implementation of the kandy kart itself has been first and foremost on my mind ever since I saw it in action on the big-screen. In this category, we will explore the pros and cons of each kart, and how they compare to the final on-screen version. – Though the treads are gummi worms, they do not have the myriad colors like in the film, with the exception of the rear right wheel, which is pretty close (even though it is a solid magenta). I was going to fault each of these karts for the rear-left chocolate cookie wheel, but I was more than willing to give this a pass when I saw the concept art for the kart in The Art of Wreck-It-Ralph. My guess is this may have been part of early design information sent to the factories for production, and by the time they decided to make the wheel a shortbread cookie, production was too far along. In the end, deciding who wins out was extremely tough, because neither kart is spot-on to the final animated product. If both of these designs were somehow combined, I’m sure the final product would be much closer to my expectations for this vehicle. As someone who loves cars (really, you should see my die-cast collection based on PIXAR’s film Cars! ), I’m always a stickler for accuracy. While I had some issues with details and size in the body of the Thinkway Toys release, it was the factor of proper coloring of the side-piping, the size of the rear spoiler (which looks about the size of a normal wafer-cookie to our size), and the raised gummi-worm treads that pushed this one ahead of some really nice body detailing done by Disney Consumer Products. (L to R): Vanellope from the film, Thinkway Toys’ Vanellope, The Disney Store’s Vanellope. I think like many out there, I didn’t expect to really find myself liking the character of Vanellope. The commercials largely made her out to seem smart-alecky, and a little bratty. However, her character’s story within the film of Wreck-It-Ralph became something that me and many others were talking about…not to mention caused a lot of her character-related merchandise to quickly disappear from shelves after the movie came out. – Eye coloration is close to film version, with a brown center and green coloration around the iris. – Head size is smaller. – Figure seems over-sized when sitting in kart. – Eye coloration is just brown, with no outer greenish tint around irises. This was another tough one.Both companies got down the basic coloration of Vanellope’s wardrobe right, and give her limited arm and leg movement. However, it was the little things that made me a real stickler for detailing. While the size of Vanellope in relation to her kart definitely stuck out like a sore thumb to me, Thinkway Toys won me over with the detail on their figure. Thinkway Toys have proven themselves to be incredibly good with making accurate figures from computer-generated information, since they designed Woody and Buzz from Toy Story way back in 1995 (their Buzz figure became one of the most sought-after figures that Holiday season!). I did wish they would have released a smaller version Vanellope in stores. I would have definitely bought it to put with the kart. Admit it: most of what we buy is influenced by the ‘P’ word. So, let’s take a quick look at how these toys compare when you bring your wallet/purse to the table. The Disney Store’s Vanellope figure and kart retails for $9.50. Thinkway Toys’ Vanellope figure and kart retails for around $18. Admit it: by now you knew what the outcome of this was going to be. Pricing-wise, I had very little problem putting down money for the Disney Store Vanellope and her kart. The reason why I was so willing to fork over $18 for the Thinkway Toys release, was because it was almost impossible find this figure on store shelves, and secondary-market prices pushed it upwards of $25+ on eBay or other online stores. Even so, availability regarding Vanellope merchandise seems to be hard to come by when it comes to her and her kart. The Disney Stores I visited after the film’s release were soon bare of Vanellope’s kart and figure from their stocks, with the other racers taking up a lot of the shelf-space. Thinkway Toys’ Vanellope Von Schweetz and her Kandy Kart! And that was my first toy showdown. I will say, that after looking and analyzing both karts, I definitely did not expect Thinkway‘s product to be my pick. The sad part is, with the limited amount of merchandise for Wreck-It-Ralph, the karts that Thinkway made were not in major distribution in stores this past Christmas. Along with Vanellope, Thinkway had also released two additional Sugar Rush racers: Taffyta Muttonfudge, and Swizzle “The Swizz” Malarkey. In the fall of 2012, fans of the TV series My Little Pony: Friendship is Magic rejoiced when Hasbro allowed vinyl figure producer Funko, to help bring more collectibles to the series’ older fan base. Collectibles for the older fans of the series have been somewhat problematic outside of the general clothing-based merchandise. Because its one of their main franchises, Hasbro generally has their hands in almost all toy-based materials. However, while they do acknowledge older fans loving the cartoon series, Hasbro is not the kind of company that is going to sink millions of dollars into partitioning out merch for the older fans. This seems to be the niche that Funko is filling. Though their vinyl figures are more like collectible sculptures than toys, they seem more willing to follow the design of the show, giving collector’s something nice to display. Funko’s first figure releases were of a main pony character, and one of the fanbase’s favorites. In this case, we had main character Rainbow Dash, and fan-favorite Derpy Hooves (which was reviewed here). In February of 2013, Funko has again followed this chain-of-thought, by giving us the main character of Fluttershy, and fan-favorite (and first stallion) release, Dr Whooves. Like Derpy Hooves, Dr Whooves started out his life as a non-descript background character. In this case, a stallion with an hourglass cutie-mark on his flank. Due to his rather spiky mane, along with the hourglass markings, some felt that he seemed to be a stallion version of the Tenth Doctor, played by David Tenant. Originally called ‘Time-Turner’ in some materials, he gained the Dr Whooves moniker unofficially in the last few years, notably on some clothing merchandise. Unlike the vinyl figurine of Derpy, Dr Whooves’ is more of a smoother, shinier finish. However, this also makes a few abnormalities stand out. One controversy that also followed the first releases, was that only one of the figure’s flanks had a cutie-mark, and this time, the same thing has happened. One has to wonder why it is so hard to put this mark on both sides of a figure, giving only one ‘good side’ to display them. The paint applications are also a little spotty in places. Of concern to me, was the painting around the eyes, which seemed a little ‘soft.’ Speaking of his eyes, this is an area where the figure ‘fails’ to me. Compared to the package design (and the screenshot above), the figure’s eyes are about 20% larger than they should be! The large eyes on the figure are a bit too distracting for me, and I put my figure into Photoshop to see what shrinking the eye down would do. As you can see on the right image above, it seems to make the sculpt a whole lot better, and closer to the Doctor’s animated counterpart. Unlike the first wave of figures, the second wave has several different variants. Dr Hooves comes with either a green, or red tie. There’s also a rare sparkly-clear variant. Though they are limited editions, the majority of fans claim they just want a ‘normal’ Doctor. In the end, the fan-favorite Dr Whooves is a good figure, and most likely the only chance we may get to seeing this figure made (I doubt Hasbro would make him, as the majority of their figures are ponies and not stallions). Not bad for the first Funko attempt at a stallion figure, but one hopes that if future stallions are made, this first step will lead them to make improvements. Doctor meets Derpy: a comparison of the stallion and pony molds from Funko. Even though there are ‘earth’ ponies and unicorns in the land of Equestria, Funko decided to give us another pegasus pony in the wake of Rainbow Dash and Derpy Hooves’ release. This time, we get one of the more timid-yet-sweet characters from the television series: Fluttershy. The soft-spoken, animal-loving pony has many fans out there (myself included), and I did wonder if Funko could do a proper figure of her justice. I must say, that Funko has impressed me greatly with what they have brought forth, and she has surpassed Derpy’s Funko figure to become my new favorite! First off, as Sweetie Belle might say, “I really like her mane!” Fluttershy has the largest shock of hair compared to her friends, and the vinyl sculpting on it is quite a sight to behold. Though this means she can only be posed properly on her left-side, the design holds up well when compared to the profile image of her animated counterpart. Plus, if angled correctly, one can also make out a heart-shape in her curved mane design. Some might pitch a fit that her hair color is more magenta than light-pink, but I’m not that picky. Unlike Dr Whooves, her eyes also seem to be a decent size, their half-closed/shy appearance works well in profile, and head-on, seem to pull off a pretty cute look. The placement also looks more natural on her face than previous pony releases. Derpy’s wall-eyed look worked well in a 3/4 profile, but head-on, seemed rather odd. Like the other releases, only one side of Fluttershy contains a cutie-mark (featuring three butterflies). The shinier vinyl I feared would be a bit distracting, but it’s not as bad, and helps accentuate the curves in her sculpt. Also, what I originally thought was Funko’s attempt to reuse an already-made mold has been debunked. Fluttershy’s head and body sculpt are brand-new. Her features are a bit rounder and ‘softer,’ which helps a great deal, notably in the area around her cheeks. Her packaging also seems to be a first for this Funko figure series, in that it contains some pink in it (notably due to the coloration fitting Fluttershy’s colors). There’s very little I have to say negatively about this figure. A few vinyl abnormalities can be found here and there, but just looking at the figure sitting atop my computer, the good outweighs what little bad there is in this release. If anything, Fluttershy should be the benchmark Funko should use when figuring out how to make their next releases even better. Average prices for the new releases runs about $16.50 apiece. I pre-ordered mine from Hot Topic, but they should be hitting store shelves there very soon. At this time, Hot Topic is still the only place to pick up Funko‘s pony figures. Rumor is the next wave of two figures should be announced very soon (Funko has stated on their Facebook page that Hot Topic will tell the masses what will be next). Speculation has been that we may see the curly-haired party pony, Pinkie Pie, and the shades-wearing DJ named Vinyl Scratch next. However, this is just rumor, but it would fit with the previous releases of one main pony, and one fan-favorite. Funko have definitely cemented themselves as one of the premier sellers of vinyl-based toys and collectibles based around popular culture, and this second wave of My Little Pony figures should definitely help get more fans interested.